Do we have the power to influence the events surrounding our lives? Or are we merely victims of our own destinies? 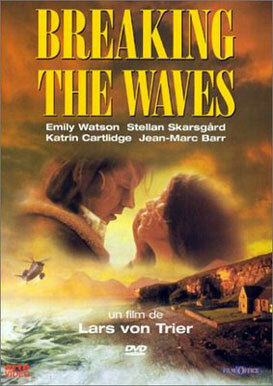 These are the question posed by Danish director Lars von Trier in his devastatingly moving film Breaking the Waves starring Emily Watson in her Oscar nominated debut performance as Bess McNeill. The story unfolds in seven chapters, each marked with its own painterly cinematic image, beginning with the marriage of Bess to an oil rig worker named Jan (Stellan Skarsgard). Arriving at the isolated Scottish seaside town by helicopter, Jan encounters a temperamental bride who lashes out at him for being late and is so eager to consummate their union that she offers herself up in the ladies room immediately after the reception. Being a good Presbyterian lass, Bess has saved herself for her husband and now unleashes all her passion in a welcome deluge of emotion. However when Jan goes back to the rig, Bess quickly unravels . Seeking guidance within the confines of the local church, she engages in a schizophrenic dialogue with God in which she assumes His austere voice as well as her own. “You must learn to endure”, she tells herself as God. But she can’t. She wants Jan back and her prayers are soon answered when a terrible accident occurs that renders him totally paralysed. In his drugged up state, Jan asks Bess to sleep with other men and relay back to him all the salacious details. She reluctantly obeys only to find herself outcast by the church and abused by the men she solicits. It’s a tragic spiralling melodrama and it won von Trier the Grand Prize of the Jury at Cannes. It’s also a tribute to faith – not the kind that misogynistic fundamentalists preach but a personal belief in the redemptive power of love.